When you think of the health benefits of olives, you probably first think of olive oil. The heart healthy benefits of olive oil are well known, but there are additional benefits we can reap from these ancient fruit. From heart protection to cancer prevention and allergy relief, many people don’t know all of the wonderful perks of eating olives. Olives are usually far too bitter to be eaten off the tree. ; this bitter flavor is interestingly related to the fruit’s antioxidant concentration. Rather than eating them from the tree, they are cured to lessen their bite. Lye curing, brine curing, and water curing are the most common treatment process. When the olive is picked, what variety it is and how it’s treated will all affect the color of the product on store shelves. 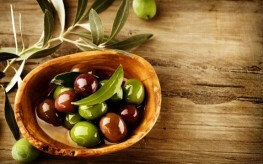 All varieties of olives are good sources of antioxidants, though some better than others. Also, the curing process may increase the concentration of some antioxidants while decreasing the prevalence of others. Still, the benefits remain no matter the approach. One phytonutrient found in olives, hydroxytyrosol, has historically been linked to cancer prevention. In addition, studies have shown it can prevent bone loss. Consumption of hydroxytyrosol and one other phytonutrient found in olives, oleuropein, has been shown to increase calcium depositing in bones and decrease loss of bone mass. Further adding on to the health benefits of olives, oleuropein has also been linked to decreased oxidation of LDL cholesterol, decreased markers of oxidative stress, nerve cell protection, and nitric oxide “scavenging”, reducing the impact of this oxygen-containing molecule. Olive extracts have been shown to function as anti-histamines in treating allergies. They are able to block histamine receptors to lessen the allergic response. These allergy benefits are also likely due to the anti-inflammatory properties of olives and olive leaf extracts. More and more grocery stores are offering olives on olive bars, where you can choose from several different varieties. This is especially useful if you are new to olives. Look for olives that are firm and that appear to be freshened by the store on a regular basis. Choose some with pits and some without, some green and some black, all to get a good mix and to determine which you prefer. Enjoy your olives in salads, blended with a bit of oil and herbs for a sandwich spread, or served alongside crudités. My great-grandfather had olive trees but never used them. I was taught that they had to be treated with lye in what I, as a child, assumed to be some archaic, toxic process. I learned recently, like you noted, that they can be cured in brine. It’s actually very simple, it just takes a little time. So… I brined some myself. Well worth the effort if you have access to fresh olives.